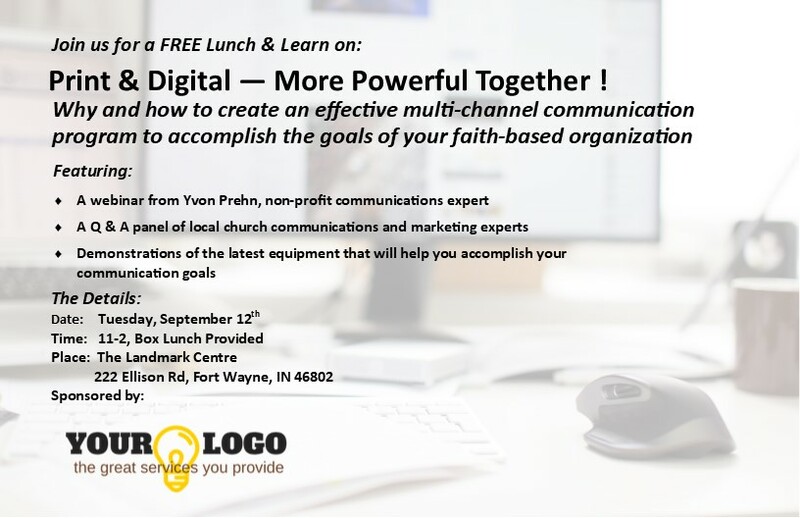 A Lunch & Learn to answer one of your biggest challenges—what about digital making print unnecessary? You are here: Home / LUNCH & LEARN / A Lunch & Learn to answer one of your biggest challenges—what about digital making print unnecessary? Personalize this Postcard for Lunch and Learn that will drive your fall sales strategy. The reality, backed up by extensive current research, is that digital isn’t nearly as effective as churches (and other businesses) wish it was. For any kind of advertising or outreach campaign to be effective you need BOTH digital and print communications. But how do you get that idea across to your clients? It takes more than a handout or conversation to honestly educate your clients on the importance of multi-channel communications. It takes a serious discussion and presentation of research, plus practical ways to implement a communication strategy that combines the best practices of both print and digital. Print & Digital — More Powerful Together ! 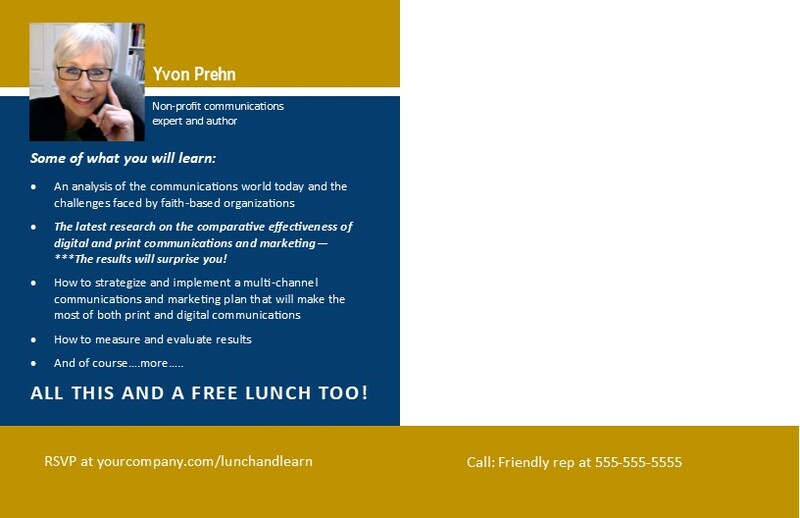 The complete Lunch and Learn will take a couple more weeks for me to complete, but I wanted to get the advertising to you now, so you can plan on it, get it on your calendar and start inviting people to it. These are for you to send out now, so people will save the date—you don’t have to tell them that—make it worthwhile and they will. The pictures of them follow. There are two sets, first, one I adapted from a really incredible design from Matt Slavin, the Marketing Contractor from Perry Pro Tech, and second, a simple set I made up. Following the images are ZIP files that have editable MS Publisher files for you to adapt to your event. 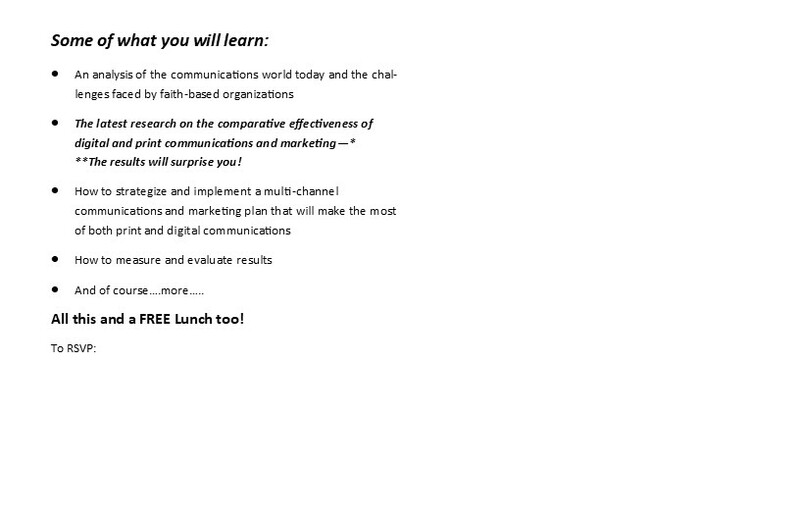 CLICK HERE for more about that and the expanded Lunch & Learn they are doing. As part of a great sales plan the RISO/Kyocera team in Phoenix, led by David Nutter is launching an extensive phone blitz first. It is a light touch, chatting to make sure they have the right contact information, person, finding out a little about what and how they print. Taking time to do this is far more effective than any mailing list you can buy for any amount of money. Thanks so much for taking the time to chat with me today! It seems like your church is doing some really exciting things and we would love to serve you in any way we can to help you be more successful. Do you go all digital? With the Bulletin or Church Newsletter? What about the people who don’t like social media or can’t access it? Is there a place for both and if so, how can we be successful with both? If you’ve had those questions, we’ve got a solution for you! 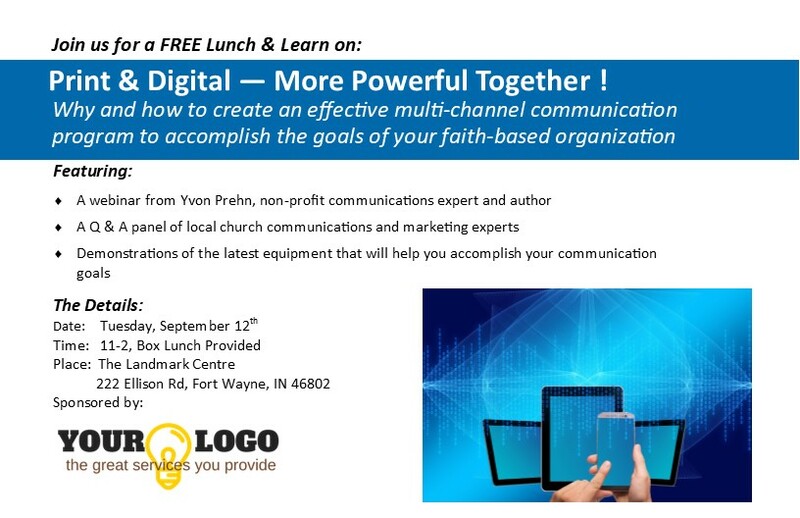 We are hosting a FREE Lunch & Learn, on (YOUR DATE HERE) at (YOUR LOCATION) featuring a webinar from Yvon Prehn, church communications author and expert. **The results will surprise you! All this and a FREE Lunch too! Email me back or call at (YOUR NUMBER) to reserve your place. 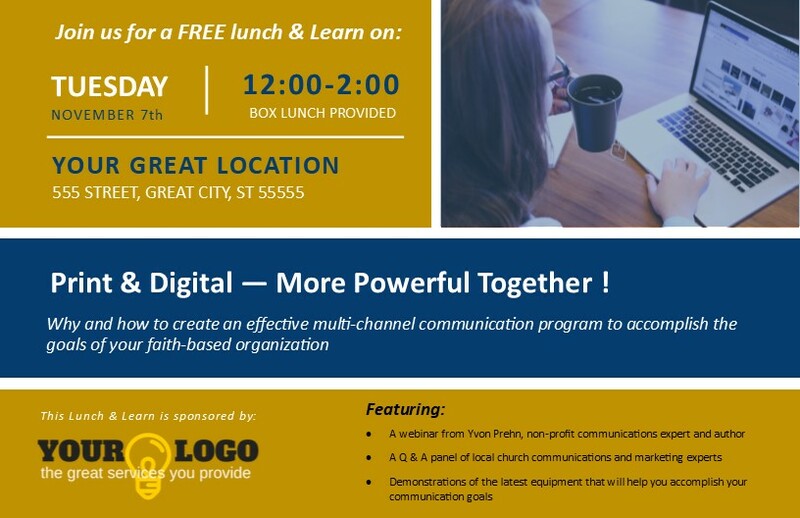 Whether you come to the Lunch & Learn or not, remember we are always here to serve your church to help make your communications more effective. Plan on hosting a Lunch & Learn this fall! There is really no better way to reach your church market and to get them looking at demonstrations of your machines. 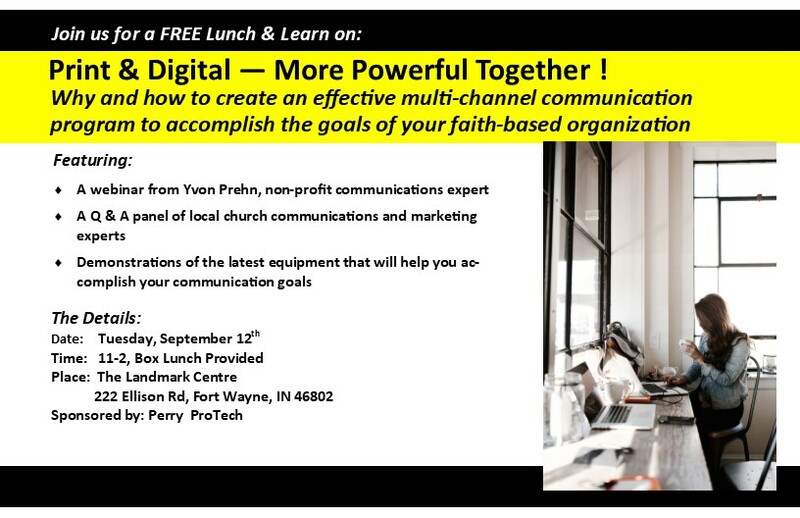 In the coming weeks I’ll have lots more to help you plan a successful Lunch and Learn on this and other topics that will significantly grow your church market business.